Manchester City qualified for the Champions League last 16 for a second successive season as a win at Roma put them through alongside Group E winners Bayern Munich. Samir Nasri scored from 25 yards after the break before Pablo Zabaleta fired in from close range. Earlier Joe Hart tipped Gervinho's strike wide before touching Kostas Manolas's header onto the post. Bayern beat CSKA Moscow 3-0 to confirm City's qualification. It completed a remarkable turnaround for the Premier League champions, who looked to be heading out of the competition after failing to win any of their first four games. However, a 3-2 home win over German champions Bayern, which included a Sergio Aguero hat-trick, kept alive their hopes of making the last 16 - and they took full advantage with a stunning display in Rome. City, who had to win a European match in Italy for the first time, were without skipper Vincent Kompany, who failed a late fitness test, the suspended Yaya Toure and injured top scorer Aguero. They struggled early on with ex-Arsenal striker Gervinho's pace causing Zabaleta problems, and the Ivory Coast international was only denied an opener by Joe Hart's fingertip save. The forward was looking a far more dynamic player to the one who frustrated Gunners fans so often as he raced beyond the visitors' defence numerous times. City, though, were dangerous too, with Nasri enjoying plenty of the ball as both sides played attacking football while looking fragile defensively. With Bayern leading at the break, Roma were on their way through with a goalless draw and City knew they had to score to stand a chance of making the last 16. And they did just that through Nasri's unstoppable strike on 60 minutes which went in via the near post. The inevitable Roma pressure followed but, thanks to Hart's brilliant save from Manolas's header and Martin Demichelis's goal-line clearance, City soaked up the pressure before Zabaleta doubled the lead with his first Champions League goal. 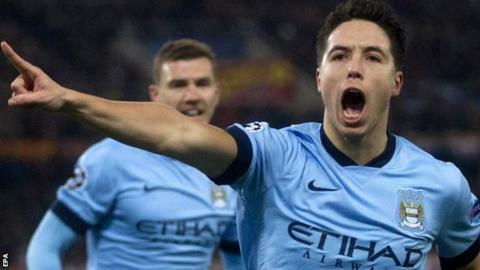 Nasri put the Argentine through to slide home from an angle to send the 1500 away fans wild and secure City's place in the draw for the last 16 on Monday. Match ends, Roma 0, Manchester City 2. Second Half ends, Roma 0, Manchester City 2. Fernando (Manchester City) wins a free kick on the left wing. Corner, Manchester City. Conceded by Kostas Manolas. Foul by Gaël Clichy (Manchester City). Samir Nasri (Manchester City) is shown the yellow card.